A world of functionality for sewers! The SwiftSmart™ threading system gives you more time to explore your creativity. The Curvy 8770 sewing machine with its iconic, curvy design has 225 built-in stitches from which to choose, including alpha-numeric stitch patterns. Personalize your projects with decorative stitching or lettering sequences. Scroll through the stitch selections displayed on the LCD screen. 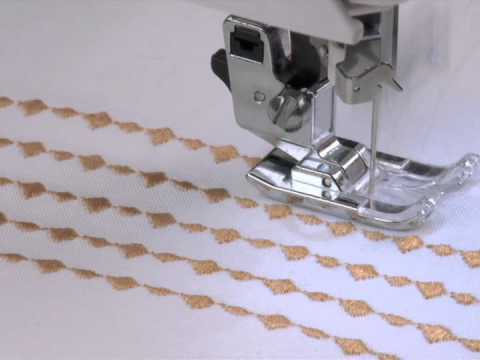 Stitch length and width settings for your selected stitch are automatic, and they can be customized as desired. Many stitches can also be Mirror-Imaged, providing even more creative possibilities. Thread the machine effortlessly with the Built-in Needle Threader. The Drop & Sew Bobbin System provides easy bobbin thread pick up so you can start sewing without having to draw up the bobbin thread. The bobbin and bobbin cover are both transparent to you can monitor your thread supply, helping you to prevent running out of thread in the middle of a seam. Sew buttonholes in one easy step with consistent results every time. There are 6 different buttonhole styles including bartack, round end and keyhole. Take off the Removable Storage Compartment to access the Free Arm, which makes it even easier to sew around trouser hems and cuffs, children's clothing and other smaller projects.